Can Anyone Stop Roger Federer Winning Wimbledon In 2018? In the last 15 years, the Wimbledon men’s singles title has been shared between just four players. Of those champions, Switzerland’s Roger Federer has triumphed eight times. Arguably men’s tennis’ greatest ever player, certainly on grass, Federer enjoyed a five-year winning streak between 2003 and 2007 that was only broken when Rafael Nadal beat him in a thrilling five-set final in 2008. A year later, Federer won the title once again, defeating the United States’ power-server Andy Roddick in a gruelling match that again went to five sets. While Federer’s hold on the Wimbledon men’s single’s title has loosened somewhat since the emergence of Novak Djokovic and Andy Murray (who have two championship wins apiece since 2010), his evergreen athleticism has seen him continue to compete at the highest level and, last year, he once again got his hands on the All England Club’s prestigious prize. As 2018’s tournament approaches, he’s a clear favourite, as Wimbledon betting puts him ahead of his long-time rival Nadal. Of course, Federer isn’t going to find his route to Wimbledon glory easy but the signs of another title at the grass season’s premier event are obvious. Nadal might have just won a Grand Slam in Paris but that was on his favoured surface and he doesn’t find his hard-hitting back-court style as effective on grass. Meanwhile, Federer missed the event to rest for Wimbledon. You’ve, therefore, got to question what Nadal’s got left in the tank after a tough French Open just a matter of weeks ago. In fact, he was due to play at a warm-up event but pulled out claiming he was still fatigued after his efforts in Paris. If Novak Djokovic and Andy Murray can get back to anywhere near their best, Federer may find they are his chief contenders for the title this year. But the signs aren’t good. Djokovic has had a tough 12 months that saw a niggling elbow injury require surgery. That coincided with him parting ways with Marian Vajda, his coach of 11 years, to join up with Andre Agassi and Radek Stepanek, hoping they could help him rediscover his best form. But the new team didn’t last long, a strained relationship ending in the Serbian player turning back to Vajda who helped him reach the quarter-finals at Roland Garros recently. Andy Murray, a two-time winner of Wimbledon, will also hope to rediscover his best form after a similarly troublesome year with injury. He hasn’t played for months and admitted to having setbacks in his return from surgery. At one point, this meant not hitting any tennis balls for two months between April and May. Now, a matter of weeks after returning to training, he fell in the opening round at Queen's Club and he’ll try to continue to rehabilitate on-court at Eastbourne, an ATP 250 grass court event. But even he admits to having zero expectations, having not completed a game of Grand Slam tennis since last year’s Wimbledon Championship. If Djokovic and Murray can’t find the form that made them Wimbledon champions in the past, attention will turn to young, up-and-comer Alexander Zverev. The German has enjoyed a great season, rising to number 3 in the world rankings and winning his third ATP 1000 title. Marin Cilic, last year’s losing finalist at Wimbledon, and Martin Del Potro, a semi-finalist in 2013, have also enjoyed solid seasons and like playing on grass. They could cause an upset if Federer has an off day. But the smart money is on the Swiss. He loves playing at Wimbledon, finds his best form on the grass courts, and is well-rested. He also enters the tournament with a weakened field with his chief rivals either fatigued (Rafael Nadal) or returning from injury after long layoffs (Djokovic and Murray). It’s Federer’s title to lose. What’s the score with Wimbledon 2017? With Wimbledon underway, things are really hotting up on the courts. With some of the tennis world’s biggest players out of action, such as Maria Sharapova who is battling injury, and Serena Williams who is expecting her first child, there are a few winning slots available for those with the gusto to take it right to the top. For those that like to put their money where their mouth is, this year’s event looks set to be great for the bookies and punters- look to SBAT betting tips for a roundup of the best! When it comes to the women- British Number 1, Johanna Konta has been suffering from an injury sustained to her spine when she fell on it last Friday. It is hoped that her team of physios will get her form up to scratch when it comes to battling it out for the top spot. Murray has also been desperately trying to recover from a painful hip injury which have seen him withdraw from two warm-up matches over the last 10 days. Some pundits are pencilling in Roger Federer as a top tip to win, which would see him win eight Wimbledon tournaments over the span of his incredible career. Lat week his odds were slashed from 21/1 to 9/4 putting him as one of the favourites to scoop the top prize. But Federer should not get too complacent as he has Rafael Nadal snapping at his heels as second favourite. Following his success at the French Open, he is looking to continue his winning streak on centre court this year. With his chances of winning pitted at 4/1 he is going to be going all out to be in with a chance to win. Other favourites include Novak Djokovic 6/1, Milos Raonic 18/1, and Marin Cilic and 18/1. When it comes to the ladies, with Serena out there is a lot of interest around who will make it to the top of this year’s ladies singles. The pundits favourite is the British No. 1 Konta who may be suffering from a bruised spine, but is hoping to still reign victorious. Another name on the lips of the press is Simona Halep, the Romanian tennis ace who nearly won her first grand slam title at Roland Garros, losing out by a whisker to Jelena Ostapenko. Looking to the Eastern Europeans, Elina Svitolina is looking promising and has made a steady climb to stardom over the last couple of years, but whether she has what it takes to take the Wimbledon trophy, remains to be seen. The wildcards in the women's section are Victoria Azarenka, Magdalena Rybarikova, and Jelena Ostapenko who are snapping at the ankles of the favourites. Venus Williams is still powering on at the age of 37 but many think that her days of glory are behind her, but you never know! It is certainly shaping up to be an amazing tournament with lots of big names competing for glory. While it is almost impossible to predict at this stage, we recommend taking the afternoon off work, pouring yourself some Pimm’s and sitting down to watch the starts of the tennis world battle it out. Why not place a bet on some matches as well, to be in with a chance of winning a little something yourself? Does Tomic Debacle Prove That More Money Means More Problems? After Bernard Tomic's recent straight sets defeat to Mischa Zverev in the first round of Wimbledon, The 24-year-old followed up the loss with one of the most extraordinary and frank press conferences that the sport has ever seen. Tomic told the press in no uncertain terms that he felt "bored" and "unmotivated" during the match, and went on to suggest that he probably doesn't respect the sport because he knows that after his career is over, he won't have to work again. Quite unsurprisingly, reactions were largely negative, and the Australian has since been fined $20,000 for the comments as well as admitting that he feigned injury in the match to halt his opponent's progress. Some commentators called for him to quit the sport, but former professional Australian rules footballer Adam Cooney sympathised with Tomic, suggesting that it's hard to give your all to a sport that you've clearly fallen out of love with. Perhaps even more disconcerting is the fact that a total of eight players retired injured in the first round of this year's Wimbledon alone. Roger Federer has claimed that players are acting disingenuously by not pulling out when knowingly unfit, instead turning up and retiring injured just to be awarded the princely sum of £35,000 for a first-round exit. It's fair to say that that while unsavoury incidents are still fairly uncommon, back in the day (whenever that was), they were almost unheard of. Compare the entertaining and often harmless antics of John McEnroe to Russian Daniil Medvedev throwing coins in the direction of the umpire's chair after his defeat earlier this week or Nick Kyrgios virtually giving up against Richard Gasquet at The All England Club in 2015, and you'd be forgiven for asking the question: is the increase in prize money throughout the sport doing more harm than it is good? If the money isn't to blame for some of the player's more petulant behaviour, then what is? On the other hand, the resurgence of the aforementioned Federer, and even to an extent Rafael Nadal, has warmed the heart of both tennis aficionados and casual watchers of the game. As someone with a wealth of both titles and riches, the evergreen Swiss star is clearly enjoying his tennis and has already managed to capture the Australian Open this year, making him the second oldest man behind Ken Rosewall to win a major crown in the Open era. After adding to this with back to back Indian Well and Miami Masters titles, Federer is the deserved 2/1 favourite for the Wimbledon crown in the tennis betting and certainly looks good to add to his already impressive seven Wimbledon titles. After skipping the entire clay court season in order to recharge for the grass courts, Federer is the embodiment of the ultimate professional and the antithesis of the attitude displayed by some of the other more controversial figures on tour. One would like to think that the fines being handed to players in serious breach of the rules will act as deterrents with regards to future behaviour. However, with a total prize pot of over $40m at Wimbledon alone this year, a $20,000 fine here and there really won't make much of a dent in the bank balances of most players inside the top 50. Tomic himself has earned almost $5m in prize money at the age of 24 while tennis's perhaps most controversial figure, Kyrgios, has earned almost the same amount at the tender age of 22. In light of recent events, one thing is for certain: tennis is in need of players like Federer and Nadal who are still playing the game with genuine love and enthusiasm well into their 30s, and the younger players could do worse than follow their lead in this regard. With all men's and women's round of sixteen matches being played on Monday at Wimbledon, there was a whole lot of top-level tennis being played at the All-England Club. Here is a quick recap of what went down on the men's side of things. Sam Querrey is proving that perseverance is key as a tennis professional as he reached his first ever Grand Slam quarterfinal at the age of 28. This is a guy who hadn't even reached the fourth round of a major since the U.S. Open back in 2010. 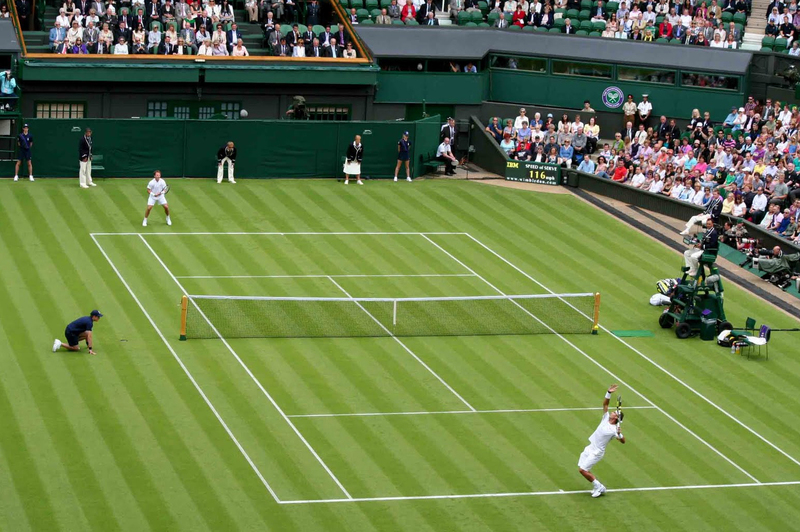 Playing three grass court tune-up events coming into Wimbledon took up quite a bit of time and money for sure, but it has proven to be a grand decision for the veteran American. Knocking off Novak Djokovic has been literally impossible for the past year and yet Querrey did it and then followed that up by maintaining his composure against a much lesser (though talented on grass) opponent in Mahut. The fact that Mahut beat Querrey a couple of weeks ago in the Netherlands grass court event ended up meaning absolutely nothing as it is Querrey who lives to fight another day. Props to Mahut for making the fourth round in singles and still playing in the doubles where he partners with countryman Herbert as the No. 1 seed. For a guy who has already had a pretty solid career at the age of 25, to call today's win the biggest of his career might be unfair. That being said, to get his first ever come-from-behind win from two sets down is epic for Canadian Milos Raonic. After the second set I thought to myself that this whole McEnroe-Raonic partnership might be a dud. Gotta eat my words on that one! Raonic did exactly what Nick Kyrgios admittedly is unable to do - dig deep and battle his way back into a match that appeared to be lost. Raonic now is the heavy favorite against Sam Querrey in the quarterfinals and looks to reach the semis at Wimbledon for the second time (2014). While Querrey took Milos out at the All-England Club back in 2012 (second round) the two are at very different points of their careers right now. Despite playing giant-killer against Djokovic, I don't see how Querrey is going to get this one if Milos plays his game. Exactly what everyone expected in this match is what came to fruition. The greatest player to ever play on grass owned the match and is cruising thus far in his favourite tournament of the year. The only problem I see here is that Roger has yet to play a real threat and is going to have much less margin for error in his next match against Marin Cilic. Can't take much out of this victory unfortunately as Nishikori is a) normally out of his element on grass and b) not playing at 100%. Still dealing with a rib injury, his own box was adamant he withdraw from the match as they saw him struggling. The re-match of the U.S. Open final from 2014 could not live up to the hype. Even if both were healthy, I would have given Cilic a big edge in this one despite being the (slightly) lower ranked player. My darkhorse to win the tournament. Tough day for Aussies at Wimbledon with Tomic, Kyrgios and wildcard doubles entry Lleyton Hewitt losing on Monday. Tomic had a good draw to begin with and in my opinion should have made the quarters. Up two sets to one, Tomic could not complete his mission and though he put up a valiant fight, let this one slip away. Nice work for the Frenchman Pouille who had a career record of 2-10 at the Slams coming into this event. Should have been a fantastic match but an injured Gasquet was forced to withdraw with a back injury before even completing the opening frame. Tsonga gets some extra rest, which he will need, to face the new tournament favorite Andy Murray. Murray keeps his unbeaten streak alive against a very dangerous young player as he downs the always controversial Krygios in straight sets. I'm starting to come around with the Aussie as I find his brutal honesty quite refreshing. Yup, he played video games the morning of his fourth round match and he admits that he was too soft to compete like a professional after the opening set. The media asks questions and laments all the robotic answers they usually get - and then they complain when a player is honest. Poor guy can't win - on or off the court today. The present and future of tennis in the Czech Republic will continue their clash on Tuesday as this match could not continue past the fourth set. Berdych should advance, but he also should have never found himself in this position. Vesely ranked 64th in the world has never been to the fourth round of a major. He has also never beaten Berdych, though the pair have only ever faced each other once before (2015 in Shenzhen). The 2010 finalist is not having the greatest of seasons. A fourth round loss at Wimbledon would seem to continue that trend. Get ready for Breakfast at Wimbledon folks! The All-England Club is set to begin play Monday and in the men's draw there will be 125 players vying to win the title for the very first time. Only Roger Federer (7), Novak Djokovic (3) and Andy Murray (1) have emerged as Wimbledon champions in years past. While young players like Dominic Thiem, Milos Raonic, David Goffin and Nick Kyrgios are making big strides on the ATP World Tour, it is still almost a virtual lock that a repeat winner will emerge once again here in 2016. With that being said, let's take a closer look at the draw and the Wimbledon Odds for this year. If it ain't broken, don't fix it. Such is the mentality of switching from clay to grass for world No. 1 Novak Djokovic who has not played a Wimbledon warm-up event on grass since Queen's Club in 2010. Clearly it has been working for the recent Roland Garros winner who has won the past two Wimbledon's and made the finals in 2013 as well. How will Novak transition to grass this year? His draw is pretty favorable until a potential meet-up with Federer in the semi-finals. Although with Fed being injured for much of the year how can we realistically expect the seven-time champion to endure multiple best-of-five set matches here this year? Djokovic opens with local long-shot James Ward and then plays the winner between Kyle Edmund/Adrian Mannarino. Easy start, let's be honest. Then he could face either Lukas Rosol who took out Rafa Nadal here in 2012 or Sam Querrey the American veteran. Neither of those players inspires any fear. His first true grass court opponent would be in the round of sixteen should he face the tricky Philipp Kohlscreiber. Still, Novak has beaten the 32 year old German seven times in-a-row including last year at this very event in the first round. A quarter-final encounter with Canadian Milos Raonic would be fun although likely still routine for Novak who has beaten John McEnroe's new charge all seven times they have played and only ever lost one set to the big-serving Raonic. Djokovic has proven to be shaky in at least one match each year at Wimbledon in recent memory. Last year he recovered from being two sets down to Kevin Anderson and in 2014 he needed five sets to defeat Marin Cilic. Will someone be able to offer him that type of resistance this year? Look for David Goffin to potentially provide some sparks in this section of the draw, although his career record at Wimbledon is a meager 5-4. He's got two potential matches against big-servers with Anderson and Raonic looking likely in the third and fourth rounds but has shown steady improvement over the past year so he could be ready to go deep here on the grass. Any other year and it would be a foregone conclusion that we would pick Federer to emerge out of his section of the draw. This year is not like other years however as the world No. 3 has gone 16-6 up to this point of 2016. By his own admission he is looking to turn his season around but without a lot of match play it is tough to bank on him to find his form over the grueling best-of-five set format. He says his body is ready after playing in Halle and Stuttgart but those were best-of-three matches which is an entirely different story. Hopefully Federer is able to play as well as he possibly can given the time off. There can't be too many more Wimbledon's left in him regardless of how he fares this year but his fans are desperately hoping that he can add title No. 8 here before he calls it a career. Federer will have Alexandr Dolgopolov as a potential third round foe and the always tricky Gilles Simon as the highest seed he could face in the fourth. If Marin Cilic is in-form in the quarters I'm not sure if Roger will be able to come out with the victory. A match-up with Djokovic in the semis will be tough to attain. Kei Nishikori is another face that one would think would be a factor in this section of the draw. The fifth seed however has never gone past the fourth round at the All England Club and after pulling out of Halle a week ago due to a rib injury I wouldn't be betting on him to cause much of a stir in this event. This quarter offers up the most intrigue to me as it could very well offer someone new the chance to make the semi-finals at Wimbledon. Number four seed Stan Wawrinka has twice made the quarters at SW19 including a heartbreaking loss 11-9 in the fifth set a year ago to Richard Gasquet. He lost in his opening match at the Aegon Championships to Fernando Verdasco which doesn't exactly give me a ton of confidence about Stan's preparation on grass right now. While it is true that Tomas Berdych has made the finals of Wimbledon before, the number ten seed has seen his play fall off somewhat this year and I'm not feeling his chances right now. He has yet to make a final in 2016 and that certainly is not going to change here at Wimbledon. Youngster Dominic Thiem meanwhile has breathed new life into things on Tour with his play this season. The 22 year old is 47-12 and won Stuttgart on grass before falling in the semis in Halle. Thiem is my pick to make the semis from this section. Other names to follow here include another young gun in Alexander Zverev. Anyone who beats Roger Federer on grass is deserving of our respect and a third round match against the Birdman should be a good one. Bernard Tomic is also lurking and has a nice route to the fourth round if he can try to avoid being too much like his usual eccentric self out there. Andy Murray is the great hope for tennis fans in the UK and will try to reverse his Grand Slam finals fortune now that he is reunited with former coach Ivan Lendl. Lendl, who was never capable of capture Wimbledon during his playing career, guided Murray to his only two Slam titles in 2012 at the U.S. Open and in 2013 at Wimbledon. I expect that the psychological impact of having Lendl back in his corner will be a positive one and that Wimbledon offers Murray the best chance of defeating Djokovic should they meet in the finals. Murray could see Nick Kyrgios in the fourth round and Richard Gasquet in the quarter-finals, neither of whom will offer him an easy match. John Isner and Jo-Wilfried Tsonga are also potential threats though to me if it's not Murray then it would have to be Gasquet advancing here. I should add that there are some crazy-fun matches in this section of the draw including a first round gem between Kyrgios and the entertaining veteran Radek Stepanek. An Isner vs. Marcos Baghdatis opener would also be fun to catch. Oh and Fabio Fognini, not exactly known as a grass court guru, is also thrown in there somewhere for good measure! Can Andy Murray Win Wimbledon This Summer? This summer, Andy Murray will look to join an elite group of tennis players as he hunts a second Wimbledon crown. The British number one has enjoyed plenty of success in recent times, none more so than during Great Britain’s Davis Cup triumph – which was their first victory for 79 years. Murray will fancy his chances of Grand Slam success this summer, especially after pushing Novak Djokovic close in the Australian Open back in January. At the time of writing, Murray is 7/2 in Coral’s tennis betting markets and plenty of journalists and pundits will be providing their own Wimbledon tips on Murray’s chances nearer to the event. After the birth of his first son shortly after the Australian Open, Murray took some time out to remain close with his family in the aftermath. But now, he’s back in business and on the hunt for a third Grand Slam crown. Murray is one of the best British players in recent memory and if there’s anyone who deserves another Grand Slam, it’s him. He’s in good form too. Murray was part of the British side that beat Japan 3-1 in their opening round of the Davis Cup defence back in March and according to Coral’s tips, Andy Murray will be there or thereabouts in all three of the major tournaments in 2016. After all, he is one of the best players on the planet right now. For Murray to achieve his ultimate goal of victory on home soil, he will have to get past arch enemy Novak Djokovic. On his day, the Serbian is more or less invincible and Murray will find it difficult to beat the world number one, particularly as Djokovic is attempting to surpass Roger Federer’s record of 17 Grand Slam titles. As of April 15th, Djokovic has 11 but that tally could be 12 by the time Wimbledon comes around. The French Open gets underway next month and the Serbian, who has never won the event, will be desperate to enhance his legacy further with a clay-based Grand Slam title. But to be fair, it could be Murray who emerges victorious in both competitions. Murray was in superb form on the clay court in 2015 and the British number one will look to exploit Djokovic’s weakness on this surface. While Wimbledon remains his number one priority, a French Open title would certainly do Murray no harm ahead of what could be a defining summer for his legacy in the sport. Two Grand Slam titles in 2016 and Murray would be well on the way to the summit of British tennis. In a difficult era, the Scot has moved with the times and is now potentially the only man to challenge Djokovic on paper. And if Murray can maintain his current form throughout the next few months, he could well claim at least one major title this summer.